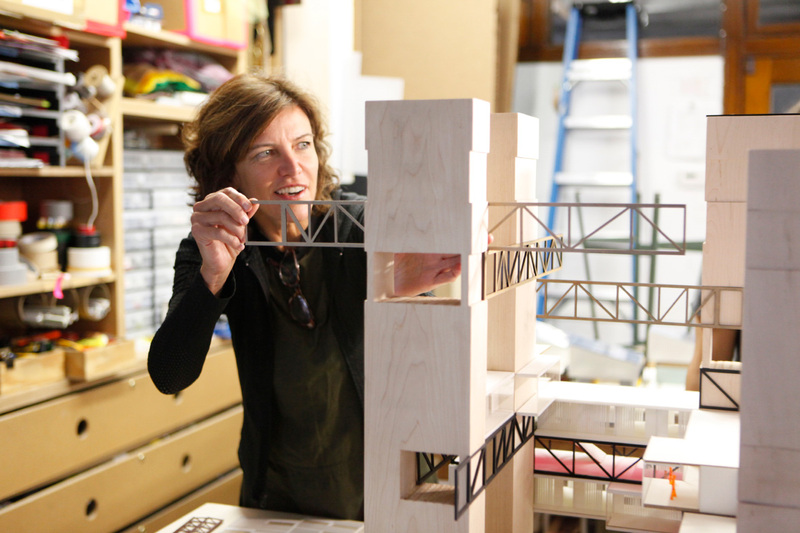 TIME magazine has released its list of 2019’s most influential people, and Studio Gang founder and 2011 MacArthur Fellow Jeanne Gang was the only architect to be included. “Jeanne Gang has the WOW factor,” wrote actress and playwright Anna Deavere Smith, who nominated Gang to the list. “Her stunning Aqua, in Chicago, is the tallest building ever built by a woman…Referring to the growing socioeconomic divides in our cities, Jeanne has warned her profession against ‘sorting ourselves into architects of the rich and architects of the poor,’ and focuses instead on discovering ‘new possibilities for the discipline and beyond.’ And it all started with playing in the dirt and making ice castles. Wow.” The Chicago-based Gang was named in the “Titans” category, where TIME honors those at the top of their respective fields, placing Gang shoulder-to-shoulder with golfer Tiger Woods, Disney CEO Bob Iger, and Facebook CEO Mark Zuckerberg. It appears that the magazine is recognizing one architect every year; in 2018 it was Elizabeth Diller, David Adjaye in 2017, and Bjarke Ingels before that. The only other design professionals singled out this year? Joanna and Chip Gaines of HGTV fame, who were nominated by former quarterback (and current Mets player) Tim Tebow. Although the Office of Metropolitan Architecture (OMA) has been in business for decades and keeps a steadily growing constellation of offices around the globe, the firm has, until recently, had a relatively modest profile on the American West Coast. But things are changing. As West Coast cities pursue new building efforts—including new neighborhoods, ecologically sensitive public parks, and experiments in multiuse complexes—OMA’s brand of frank intellectualism has slowly found a preliminary foothold in California. The firm’s expanding Golden State presence includes a recently completed urban master plan for Facebook’s Willowbrook campus in Menlo Park, a residential condominium tower in San Francisco, as well as a trio of inventive projects in Los Angeles. Over the next few years, these projects are poised to join the Seattle Central Library and the Prada Epicenter Los Angeles, both from 2004, OMA’s only completed West Coast projects to date. 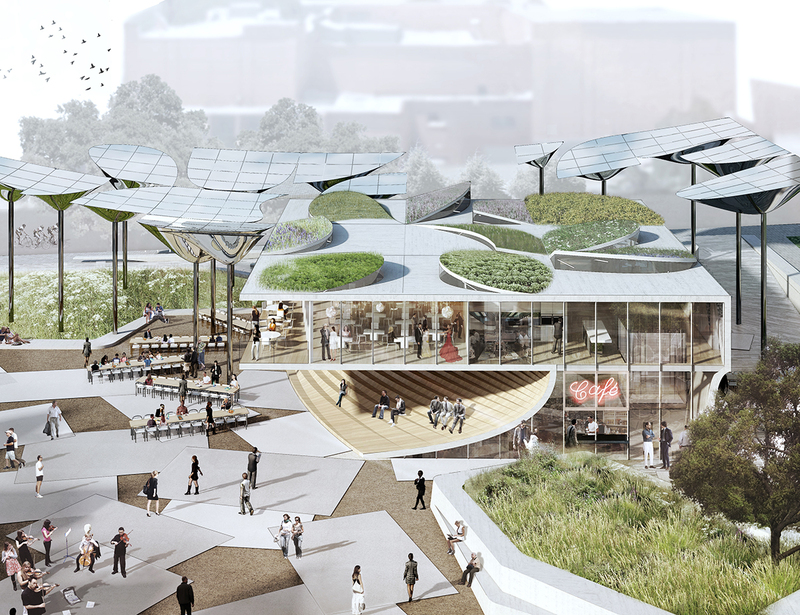 Also created in collaboration with Studio-MLA, the new First and Broadway Park in Los Angeles is set to contain a playful 100,000-square-foot retail, food, and cultural programming pavilion that anchors the ecologically sensitive park. The pavilion will be capped with an edible rooftop garden and a dining terrace that overlooks L.A.’s City Hall. Along the ground, the park will be wrapped with ribbons of bench seating, elements fashioned to create interlocking outdoor rooms and plazas surrounded by native oak and sycamore trees. Water-absorbing landscapes around the seating areas are designed to harvest and retain rainwater while solar collection and a “Golden California” landscape lend the project its ecological bona fides. Related California’s crenelated 575-foot tower, known as The Avery, is part of a larger development created in conjunction with Fougeron Architecture for a blank site in downtown San Francisco’s bustling Transbay District. 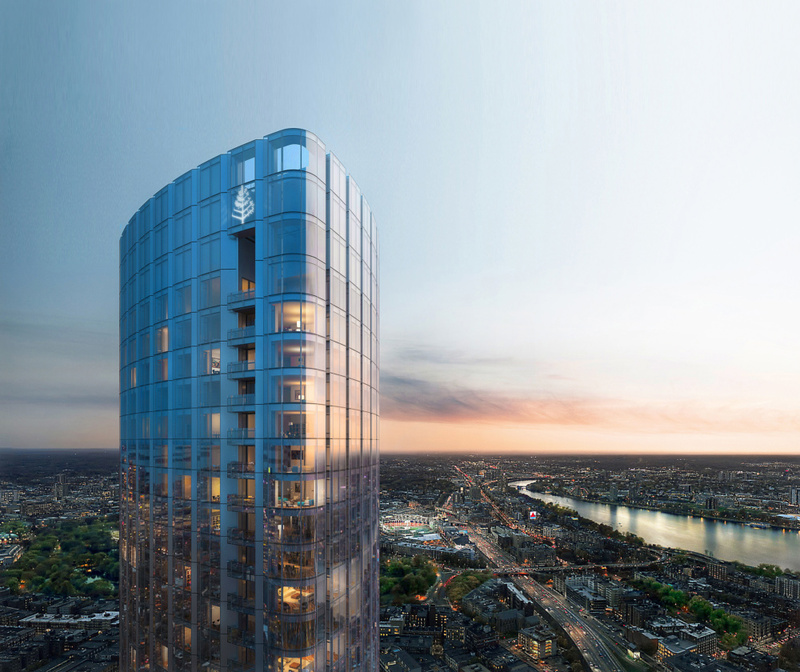 For the project, the designers have carved a generous paseo through the buildable envelope for the site, creating a new retail and amenity plaza while also lending a tapered look to the 55-story tower. The gesture animates views for a collection of condominiums, market-rate apartments, and affordable housing units while also bringing sunlight down into the paseo and to the mid-rise block designed by Fougeron. Currently under construction, the tower is expected to open in 2019. The Audrey Irmas Pavilion is the firm’s first cultural and religious project in the region. 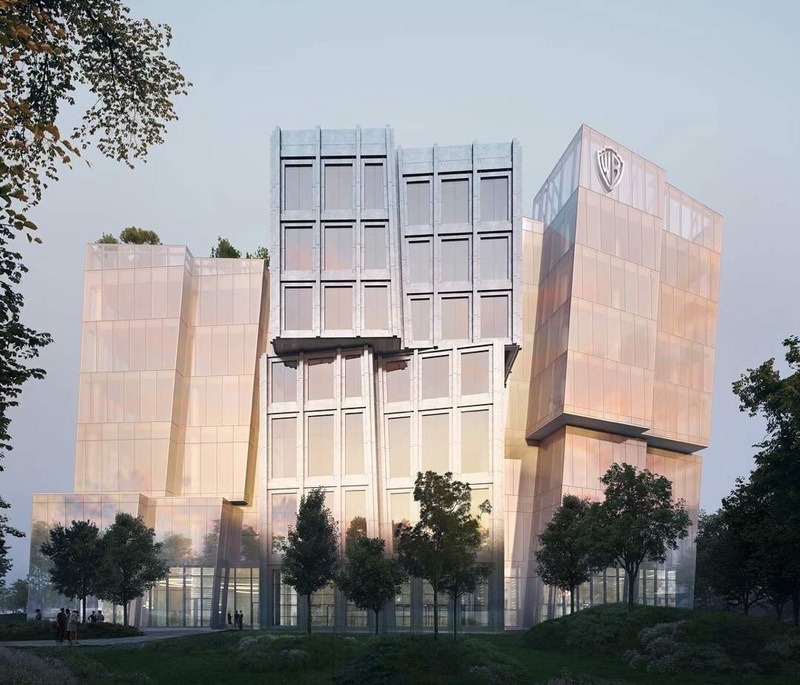 The trapezoidal building shares a site with the Wilshire Boulevard Temple and is made up of three interlocking volumes that connect to the outdoors via a sunken rooftop garden designed by landscape architecture firm Studio-MLA. An arched portal connects to a shared breezeway between the pavilion and the temple, which is framed by the leaning pavilion. The latter was designed with a pronounced slant both out of deference to historical structure and to illuminate the courtyard. Shigematsu explains that one concern driving the firm’s California projects involves delving into the region’s rich history of indoor-outdoor living. The approach is fully on display in The Plaza at Santa Monica, a 500,000-square-foot staggered mass of interlocking buildings intended to create a new mix of public outdoor spaces. With a cultural venue embedded in the heart of the complex and ancillary indoor and outdoor public spaces laid out across building terraces, the complex aims for a unique take on the regional indoor-outdoor typology. The building is set to contain offices, a 225-suite hotel, as well as a market hall and public ice-skating rink. Chinese real estate developer SOHO China has won a 200,000 yuan—nearly $30,000—libel case against a blogger who wrote that the Zaha Hadid Architects (ZHA)-designed Wangjing SOHO was bringing bad luck to its tenants. In November of last year, a blog run by Zhuhai Shengun Network Technology wrote that the triple-building office complex in Beijing had bad feng shui. 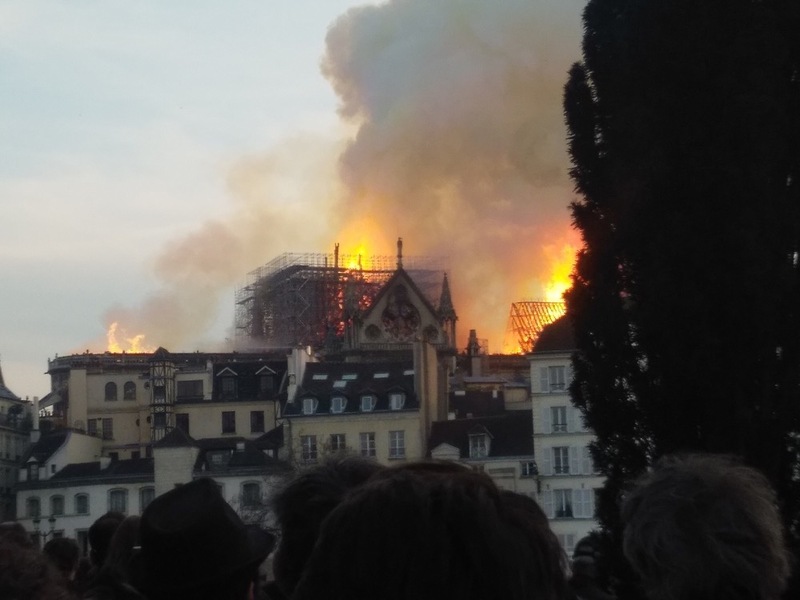 Among the article’s many claims is that the pebble-shaped buildings looked like “pig kidneys” and that they were a “Waterloo” for the companies working within. The post, which was viewed over 100,000 times before being deleted from messaging platform WeChat, went on to say that larger companies should flee the Wangjing SOHO unless they wanted their growth to slow. On April 10, a Beijing district court ordered that the blog operator pay $29,796 and apologize to SOHO China. In its verdict, the court ruled that the article “applies superstition to Wangjing Soho building, which institutes defamation,” according to the South China Morning Post. The blog itself, S Shengunju S, was deleted in November along with 9,800 other accounts as part of a larger social media post and blog purge by the Chinese government. Feng shui is an ancient practice of precisely orienting buildings and their interiors to invite in energy, wealth, and prosperity that still has many modern adherents all over the world. 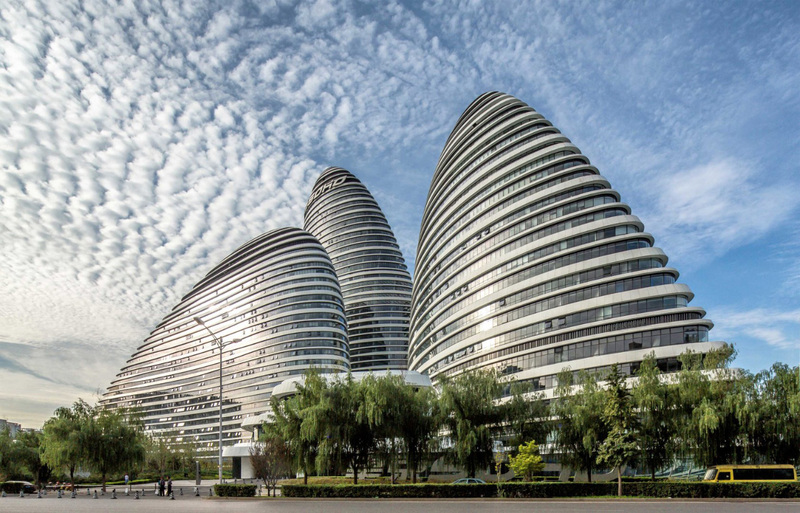 However, regardless of whether the feng shui of the 5.4 million-square-foot Wangjing SOHO is off or not, the complex has been a success by more than one measure; after the complex’s design was “stolen” in 2013, it went on to win several awards and has a 98 percent occupancy rate. 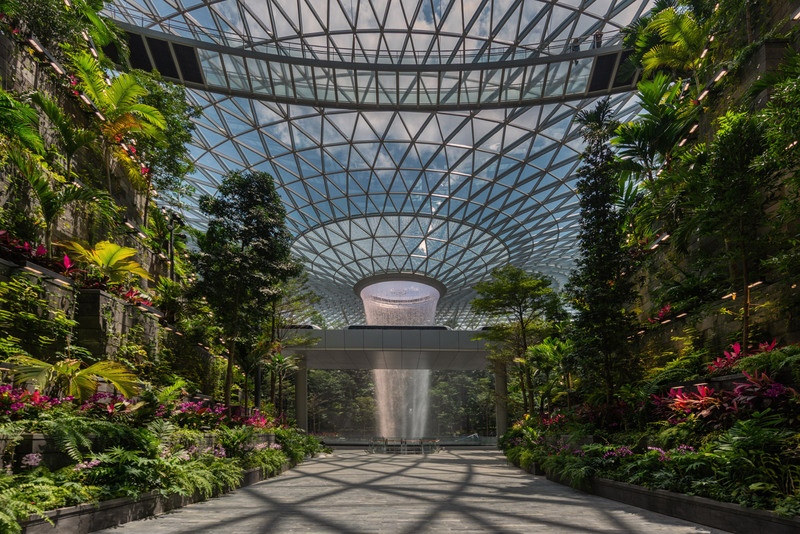 After six years, the first phase of Safdie Architects’ monumental Jewel Changi Airport in Singapore will open to the public on April 17. That not only includes an indoor “rain forest” with walking trails, but also the world’s largest indoor waterfall. The 1.4-million-square-foot doughnut-shaped building is a greenhouse ensconced within a steel diagrid frame engineered by BuroHappold. The five-story toroid stretches another five levels underground as well and is designed to connect the Changi Airport’s terminals 1, 2, and 3, and to public transit. Jewel was conceived of as an amenity hub for the airport and contains over 280 retail stores, galleries, and restaurants, a 130-room hotel, and operations space for the airport, including a lounge and check-in area. To mitigate the noise from the aircraft taking off around it, the triangular window sections were installed with a .6-inch-thick air gap between the two glass panes. Jewel's crowning feature is its seven-story indoor waterfall, the “Rain Vortex,” which dramatically pours down from a central oculus and into a circular catch below. The waterfall is, appropriately enough, fed by water collected during Singapore’s constant thunderstorms, and the recirculated rainwater diffuses throughout the Jewel to passively cool the interior. All of that humidity also helps maintain the thousands of plants, including 2,000 trees, found within. Other than the Forest Valley, which includes terraced vegetation and “forest walks” around the waterfall, the 150,000-square-foot Canopy Park on the fifth floor further enhances then garden feel. Glass bottomed bridges, topiary mazes, sky nets (suspended net paths), mirrored “discovery slides” that will open on June 10, and a gathering space for up to 1,000 guests can all be found on the Jewel’s top floor. Such an enormous undertaking was a collaborative effort, and Safdie led a multidisciplinary group of designers and engineers. Atelier Ten was responsible for the building’s climate control systems; Singapore’s RSP Architects Planners & Engineers was the project’s executive architect; the Berkeley, California-based Peter Walker and Partners was responsible for the landscape design and plant selection; and Los Angeles’s WET engineered the Rain Vortex and developed a 360-degree light and sound show to play against the waterfall at night. 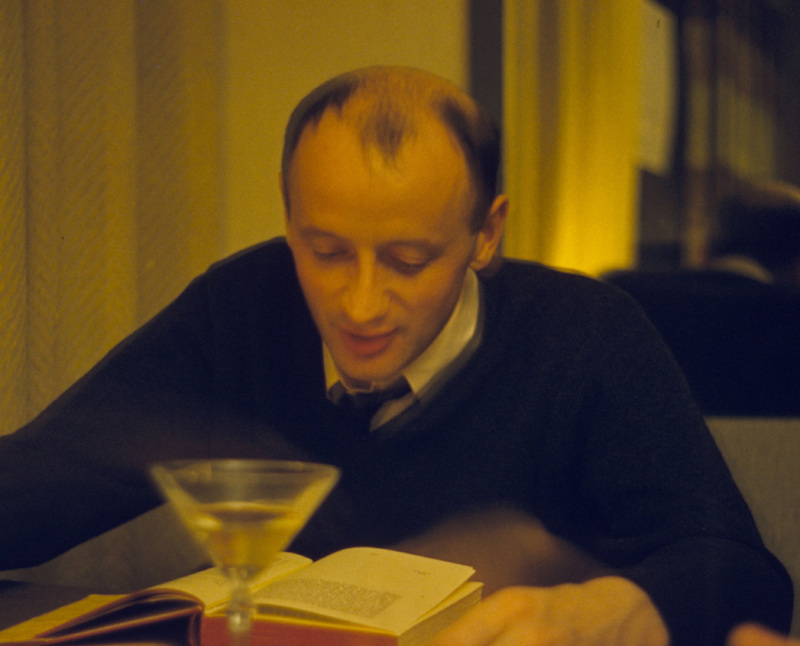 The death of architect Kevin Roche on March 1 at 96 marked the end of an era—the midcentury modern era that the work of his mentor, Eero Saarinen, came to symbolize. Roche and his late partner, John Dinkeloo, founded the successor firm that finished a number of the projects that remained incomplete when Saarinen died in 1961 at 51. Roche, Dinkeloo, and their partners then went on to build impressive high modern buildings of their own. 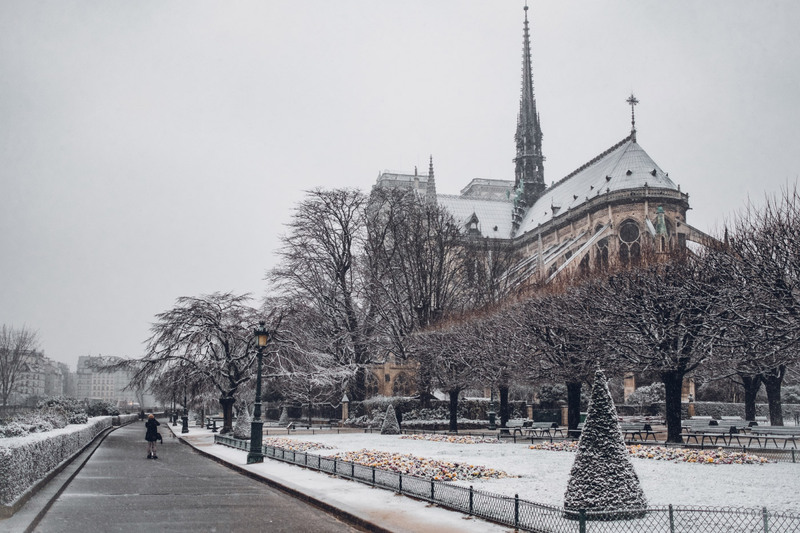 Roche, who was born in Dublin, Ireland, studied architecture at the National University there, and received his first commission even before he graduated. It was from his father, Eamonn Roche, for a piggery in County Cork that housed 1,000 animals. After completing his degree in 1945, he became an apprentice to Ireland’s most important modern architect, Michael Scott, and worked on the Busáras bus station, Dublin’s first significant modern building. Then he moved to London to work for Maxwell Fry, where he read an article in The Architectural Review about Mies van der Rohe, who “was not as well known as Le Corbusier at the time,” and decided to come to America to study with him at the Illinois Institute of Technology. That venture, in 1948, was short-lived, as Roche was short on funds and found the experience disappointing. So he moved to New York to join the officially international team designing the United Nations headquarters under Wallace Harrison, before moving to Bloomfield Hills, Michigan, to join an unintentionally international team in the office of Eero Saarinen. It was the place to be at that moment in time, with people from all over the world in the office, including Chuck Bassett, Gunnar Birkerts, Edmund Bacon, Kent Cooper, Niels Diffrient, Ulrich Franzen, Olav Hammarström, Hugh Hardy, Nobuo Hozumi, Mark Jaroszewicz, Louis Kahn, Paul Kennon, Joe Lacy, Anthony Lumsden, Leonard Parker, Glen Paulsen, Cesar Pelli, David Powrie, Harold Roth, Robert Venturi, and Lebbeus Woods. “And everyone was designing,” as Venturi once told me. “It was not like today when half the people would be doing public relations or something.” Roche, who arrived in the office as it was beginning to grow from 10 to over 100, soon became Saarinen’s right-hand man. 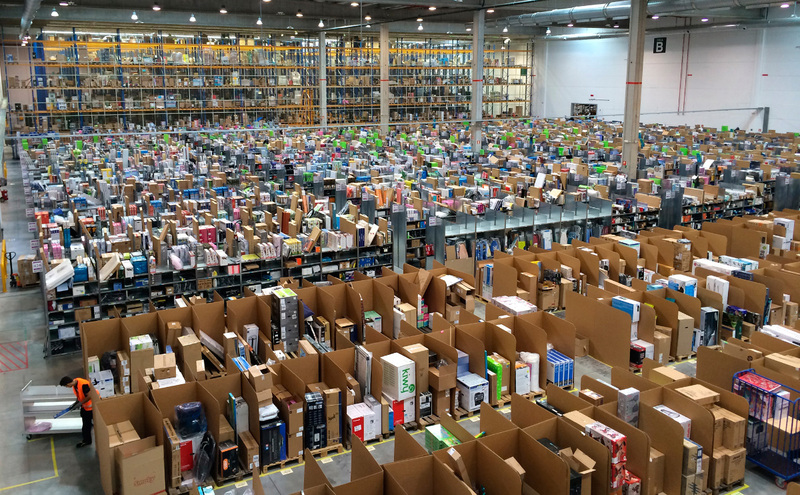 “He liked the way I organized a job,” Roche told me. The way things were done there was that every day a number of the young architects would be asked to work on a building or a part of a building, to sketch and develop ideas. Then Roche would collect the sketches and hang them up for Saarinen to examine. Eero would come in later and pick the most interesting ones and ask the person who had created it to develop it further. It was a devastating experience for some, like Venturi, whose sketches were never chosen, and a high for those, like Pelli, who were asked to develop designs further and put in charge of important projects. After Saarinen died, the firm moved to New Haven as previously planned. Some then drifted off. Pelli, for example, left after completing the TWA Terminal (formally the TWA Flight Center) and the Morse and Stiles Colleges at Yale. Roche remained in Connecticut and, along with technologically gifted John Dinkeloo and some other talented young architects, founded Kevin Roche John Dinkeloo and Partners. They completed Saarinen’s Corten-steel-faced John Deere & Company headquarters in Moline, Illinois (1964), the mirrored glass Bell Telephone Corporation Laboratories in Holmdel, New Jersey (1962), the iconic North Christian Church in Columbus, Indiana (1964), and the dignified Columbia Broadcasting System Headquarters in New York City (1965). Roche Dinkeloo then went on to design numerous distinctive buildings, such as the dark metal and glass Ford Foundation headquarters in Manhattan with its central, enclosed garden (1967); the Oakland Museum of California (1969), with a 5-acre terraced roof (designed by Dan Kiley) that functions as a public park; and the rather funereal but original Center for the Arts at Wesleyan University in Connecticut (1973). There were corporate headquarters—a sprawling white-walled palazzo for General Foods in Rye Brook, New York (1982); a futuristic, low-lying structure for Union Carbide in Danbury, Connecticut, that houses cars as comfortably as workers (also 1982); and a columnar skyscraper on Wall Street for J. P. Morgan (1990)—among the practice’s 50 or more projects. Over the years, Roche Dinkeloo designed and renovated galleries at New York’s Metropolitan Museum of Art, including the dramatic pavilion for the Temple of Dendur; the Jewish Museum on Fifth Avenue; and the Museum of Jewish Heritage in Battery Park City. Although his firm did buildings all over the world, Roche’s last major one was a conference center in Dublin, where he had been born in 1922. Roche’s close relationship with Saarinen defined much of his career, though. He met his wife, Jane Clair Tuohy, at Saarinen’s office. They were planning to marry a few weeks after Eero died but waited until 1963. His wife, five children, and 15 grandchildren survive him. Roche was a recipient of the Pritzker Prize in 1982 and the Gold Medal of the American Institute of Architects in 1993. He will be remembered as a major figure of his time. This past week in Milan during Salone del Mobile while designers were showing off their latest furnishings, Google was putting on its own exhibition. 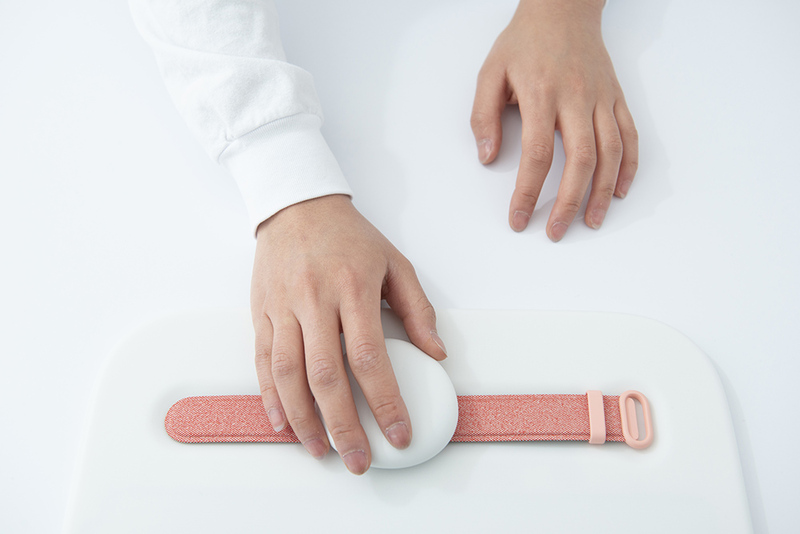 Following up on last year’s Softwear exhibition, in which the company teamed up with Li Edelkoort to envision a more comfortable, integrated hardware future, this year the tech giant built out three rooms in the Spazio Maiocchi for a show called A Space for Being. A Space for Being explored the ways qualitative senses could be understood with quantitative metrics. Google collaborated with Susan Magsamen of the International Arts + Mind Lab at Johns Hopkins University's Brain Science Institute to develop a design installation that explored the possibilities of neuroaesthetics, or the brain’s and body's responses to the aesthetic world. 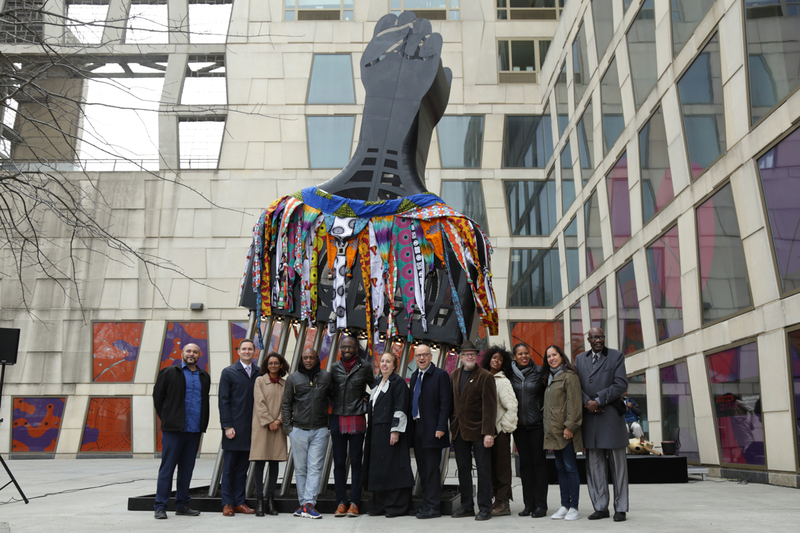 Visitors lined up around the block to be adorned with a wristband that collected biometric data while they explored the rooms' various furnishings, colors, lights, music, scents, and textiles by Google’s Ivy Ross, Muuto’s Christian Grosen, and Reddymade’s Suchi Reddy. At the end of their walkthroughs, attendees were given synopses of their bodies’ responses to the various spaces, helping them see in which context they were most at ease. While this kind of data-driven neuroaesthetic approach is still in its nascent stages, one could imagine a future when data-driven design becomes more normal, especially in settings like healthcare. Even for those who might balk at the idea of collecting this kind of information to create something so subjective as an interior, the results show that design has a profound impact on us, our biology, and our wellbeing. For more on the latest in AEC technology and for information about the upcoming TECH+ conference, visit techplusexpo.com/nyc/.